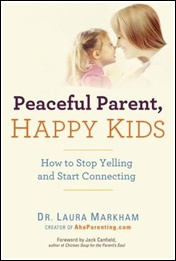 I just finished reading this wonderful book called ‘Peaceful Parent, Happy Kids: How To Stop Yelling and Start Connecting’ by Dr. Laura Markham. That does not mean I yell. OK, sometimes I do. But the reason I like reading these books is that I don’t want my inadequacies to influence my child’s life. Books cannot teach you how to raise a child, but they can certainly offer rational and inspiring insights to become a better parent, and therefore a better person. This book essentially believes in the simple philosophy that kids are people too, and they deserve empathy, respect and connection. See, on the face of it, we all agree with this philosophy but when we are really having a tough time, we get caught up in ‘trying to discipline’ or ‘teaching the right thing’ or such trappings of being a parent. The first step is to analyze yourself. Most of the time, problem is not with the child but within ourselves – are we holding onto the way we have been brought up? Are we stressed about our own lives? Do we have too much on our plate? Are we giving ourselves time to thrive? We have to find ways to de-stress, resolve our issues and generally be happy. Happiness begets happiness. Mindful parenting means being aware of our situation, what triggers our anger and our action plan to immediately deal with it before it does lasting damage to our child or to the relationship. OK, so you are not supposed to be Zen-like; it just asks you to be aware. There is nothing wrong in being angry but doing irreversible damage to your child – physically or emotionally – is wrong. How you deal with anger also teaches your child a lot about dealing with difficult emotions. Unconditional parenting seeks to offer a child a space where he is not supposed to transact for everything – ‘if you eat that veggie, you well get the chocolate; if you behave well in front of the guests, you will get the new game’, and so on and so forth. We must let go of our urgency to ‘teach’ correct behavior or everything right now. Correct behavior is a consequence of our connection with the child and our own behavior [and also a lot of other things so to say]. A child must be allowed to express his emotions – anger or frustration or anything else – because if we stop him from doing it, he will learn to behave but also to well-up his emotions which will certainly come out in some way or the other. Of course, he must not be allowed to hurt himself or anyone else. Little kids especially, get overwhelmed by their emotions [just imagine how unreasonable we become even as grown-ups when we are really angry] so they need us to articulate what they are going through, with love and empathy. Remember that much-shared thought “a child needs the most love when he deserves it the least”. This is what it means. Discipline [when it is a euphemism for punishment] does not work. Punishment never teaches the child anything about doing the right thing. It just makes him feel bad about himself. May be it will sort out the short-term goals of ‘behaving’ for the fear of punishment; but when we want to encourage self-motivated correct behavior in children, this is certainly not the way to go about it. So you ask what do we do? Give lots of hugs to begin with. If he is hitting you in frustration, for example, hold his hands gently and tell him that you understand he is angry about the situation [whatever it is] and it is ok to be angry but we cannot hurt other people. Tantrum or acting out is not an action, it is a consequence of deeper feelings. When a child feels disconnected, he seeks attention. It is our prerogative whether to give him bad attention [punishment] or good one [empathy]. Understanding someone does not mean you approve of their behavior. We must offer opportunities to empower our child. And in return, we must also not wield our own power unnecessarily by saying ‘No’ to every second thing or physically intimidating the child. At the end, what matters is your connection with your child. If he is deeply connected with you, he will not seek love and unconditional acceptance outside. Deep connection really happens when you invest into it, empathize with his situation. Kids will need better Emotional Intelligence to thrive in this competitive and insensitive world, and empathy is the foundation of Emotional Intelligence. These aren’t the only takeaways from the book but a few which really stood out for me. I highly recommend it, if this philosophy appeals to you. I personally loved it, and I think I must revisit it every once in a while to keep me on the path. ← Are We Doing Enough ?